Maranda from No More Homeless Pets in Utah came to the caffe and picked up the donations and gifts for the homeless pets today. She was really excited and happy to see how generous our friends had been. We collected a lot of food, blankets, toys, and treats for the animals this holiday season. We were also able to get some cash donations that all went to help spay and neuter the shelter animals as well. Thank you! 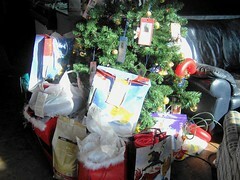 These are just some of the gifts you brought!